Comparison of earnings of one company with another does not make any sense. Similarly, comparing market price of two stocks is meaningless as there are number of other factors that need to be checked before taking a decision. Earnings per share or EPS is one of those factors which need to be looked into while doing research of a stock. Earnings per share or EPS is a very common phrase in the financial market. EPS is calculated to find out the portion of company’s net profit that can be allocated to each share of its common stock i.e. EPS tells you how much net income the company has earned for each share you own. Two factors are required to calculate EPS. Number one is, net profit or net earnings of the company which can be found from company’s profit and loss account and the second one is number of shares outstanding at the end of the year. If you want to calculate EPS of a quarter then this calculation should be done by taking quarterly net earning with the number of shared outstanding on the last date of the quarter. Both net earnings and number of shares outstanding can be obtained from company’s annual report or from any financial website. Let us assume that company X ltd has net profit of Rs. 2, 00,000 at the end of the year. Same year company’s number of shares are 1, 00,000. 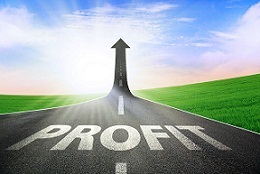 EPS is calculated to find out how profitable the company is in comparison to others. If your EPS is higher compare to others then your company is more profitable than the one with low EPS. To know in which company you should invest, one of the factor while comparing should be the comparison of EPS. You should not take your investment decision only by basing on EPS. There are number of other factors which should be looked in before taking an investment decision and EPS is one of them. As per GAAP requirements, publicly owned businesses must report their earning per share or EPS below the net income in their income statement. This is communicated by management so that anyone can compare it with the market price of their shares. What Is Stock Split for investors ?